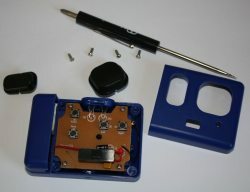 In my post about Controlling a toy car with a Raspberry Pi, I skipped over one important detail: the battery. How do you power the RPi while it's driving around the room? Most RPi sites warn that you shouldn't use the Pi with a power supply drawing less than an amp. I suspect that's overstated, and it probably doesn't draw more than half of that most of the time; but add the draw of two motors and we're talking a fairly beefy battery, not a couple of AAs or a 9V. Luckily, as an R/C plane pilot, I have a fridge full of small 2- and 3-cell lithium-polymer batteries (and a li-po charger to go with them). The problem is: the Pi is rather picky about its input voltage. It wants 5V and nothing else. A 2-cell li-po is 7.4V. 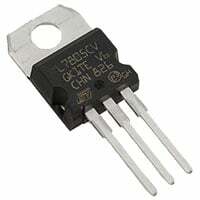 So I needed some sort of voltage regulator. It's easy enough to get a simple 5V voltage regulator (pictured at right) -- 30c at Jameco, not much more locally. But they're apparently fairly inefficient, and need a heat sink for high current loads. So I decided to blow the big bucks ($15) for a 5V step-down power converter (left) that claims to be 94% efficient with no need for a heat sink. Unlike most of Adafruit's products, this one comes with no tutorials and no hints as to pinouts, but after a little searching, I determined that the pins worked the same way as the cheap voltage regulators. With the red logo facing you, the left pin (your left) is input power from the battery; middle is ground (connect this to the battery's ground which is shared with the Pi's ground); the right pin is the regulated 5V output, which goes to pin 2 on the Pi's GPIO connector. I was able to run both the RPi and the motor drive circuit off the same 7.4 volt 2-cell li-po battery (which almost certainly wouldn't work with 4 AAs, though it might work with 8). A 500 mAh battery seems to be plenty to drive the RPi and the car, though I don't know how long the battery life will be. I'll probably be using 610 mAh batteries for most of my testing, since I have a collection of them for the aerial combat planes. 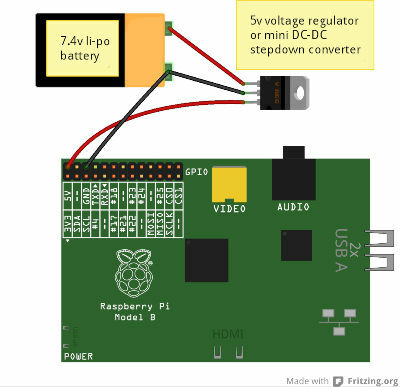 Here's a wiring diagram made with Fritzing showing how to hook up the battery to power a RPi. If you're driving motors, you can run a line from the battery's + terminal (the left pin of the voltage regulator) as your motor voltage source, and use the right pin as your 5V logic source for whatever motor controller chip you're using. 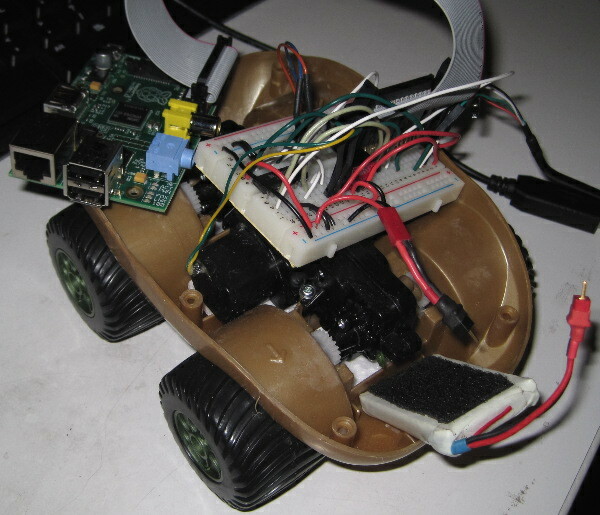 In my previous article about pulse-width modulation on Raspberry Pi, I mentioned that the reason I wanted PWM on several pins at once was to drive several motors, for a robotic car. But there's more to driving motors than just PWM. 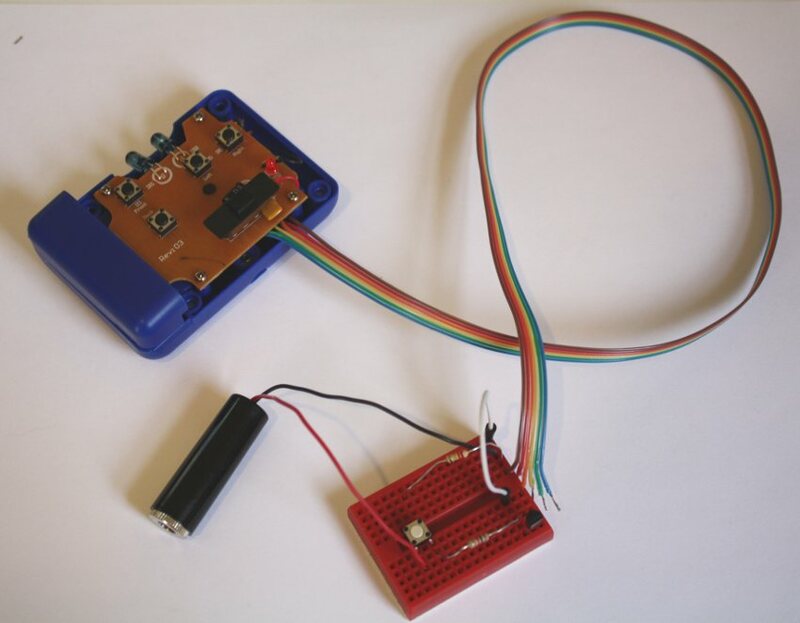 The GPIO output pins of a Pi don't have either enough current or enough voltage to drive a motor. So you need to use a separate power supply to drive the motors, and do some sort of switching -- at minimum, a transistor or relay for each motor. There are lots of motor driver chips. For Arduinos, "motor shields", and such things are starting to become available for the Pi as well. But motor shields are expensive, usually more than the Pi costs itself. 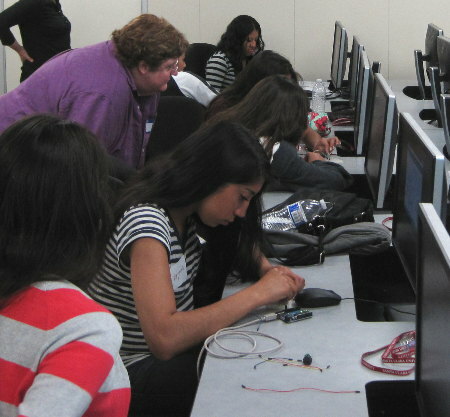 If you're trying to outfit a robotics class, or to help low-income students build robots, it's not a great solution. 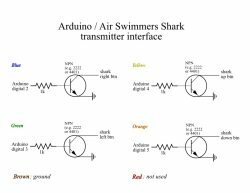 When I struggled with this problem for the Arduino, the solution I eventually hit on was a SN754410 H-bridge chip. For under $2, you get bidirectional control of two DC motors. 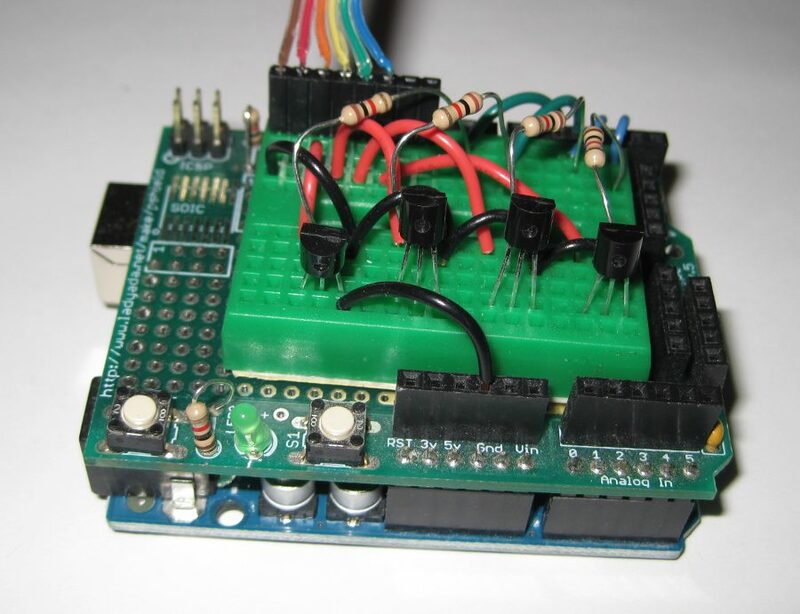 For each motor, you send input to the chip via a PWM line and two directional control lines. The only problem is the snarl of wiring. One PWM and two direction lines per motor is six wires, plus power for the chip's logic side, power for the motors, and ground, and the three pins for a serial cable, and you're talking a lot of wires to plug in. Although this is all easy in comcept, it's also easy to get a wire plugged in one spot over on the breadboard from where it ought to be, and then nothing works. ... though, as you'll see, some of those pin assignments ended up getting changed later. 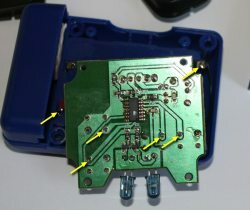 One more thing: I found that I had to connect the chip's logic V+ (pin 2 on the SN754410) to the 5v pin on the RPi, not the 3.3V pin. 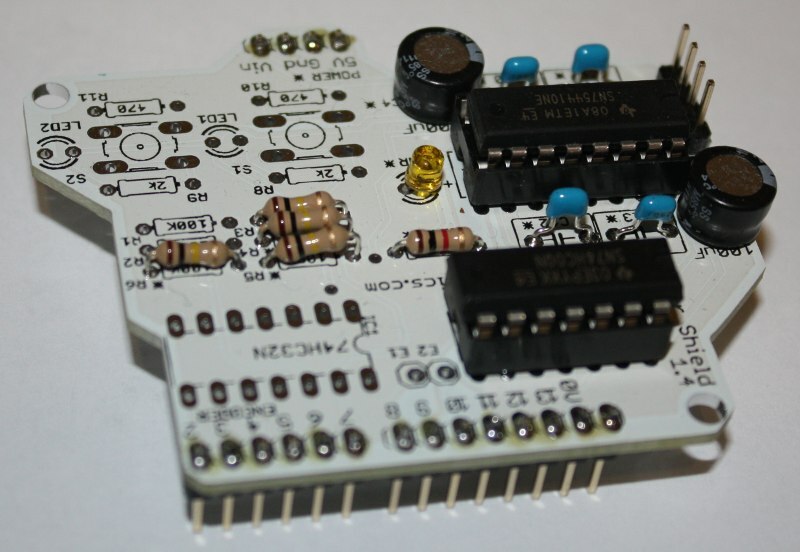 The SN754410 is okay with 3.3V logic signals, but it seems to need a full 5V of power. 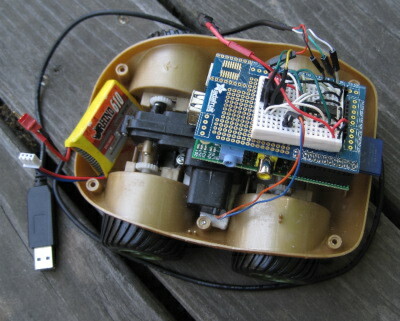 The software control is a little trickier than it ought to be, too, because of the 2-wire control lines on each motor. With both lines high or both lines low, nothing moves. (Some motor driver chips distinguish between those two states: e.g. both low might be a brake, while both high lets the motor freewheel; but I haven't seen anything indicating the SN754410 makes any distinction.) Then set one line high, the other low, and the motor spins one way; reverse the lines, and the motor spins the other way. Assuming, of course, the PWM line is sending a signal. Of course, you need RPI.GPIO version 0.5.2a or later to do any of this PWM control. Get it via pip install --upgrade RPi.GPIO -- the RPI.GPIO in Raspbian mis-reports its version and is really 0.5.1a. Simple enough in concept. Okay, now try explaining that to beginning programmers. No, thanks! So I wrote a PiMotor class in Python that takes care of all those details. Initialize it with the pins you want to use, then use calls like set_speed(s) and stop(). 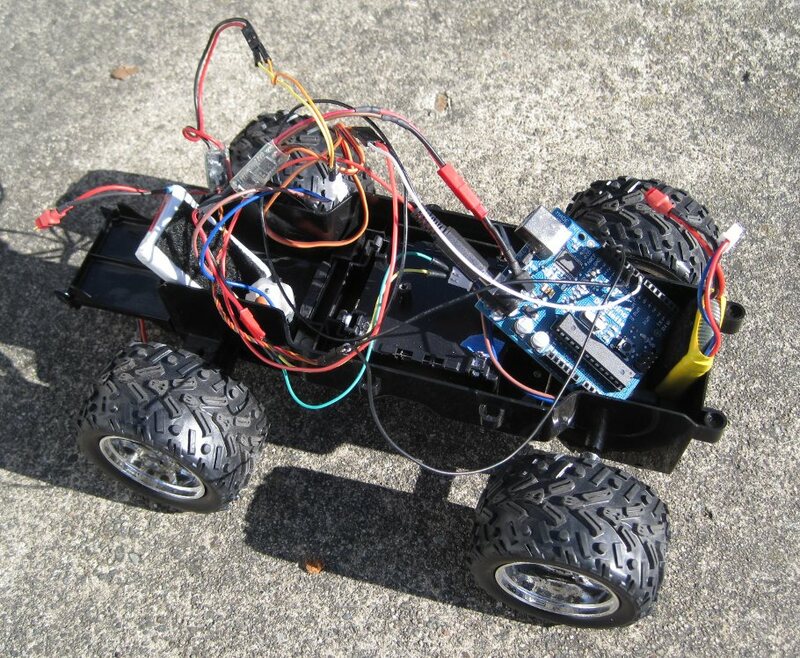 It's on GitHub at pimotors.py. I put the H-bridge chip on a breadboard, wired up all the lines to the Pi and a lithium-polymer airplane battery, and (after several hours of head-banging while I found all the errors in my wiring), sure enough, I could get the motors to spin. 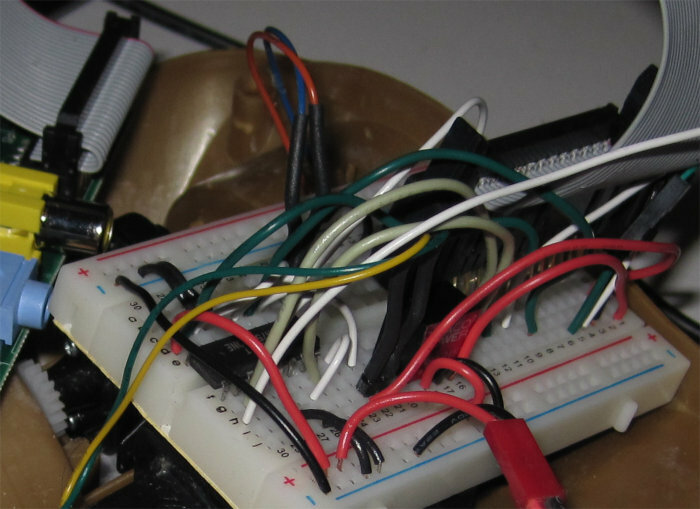 But one thing I found while wiring was that I couldn't always use the GPIO lines I'd intended to use. The RPi has seemingly a lot of GPIO lines -- but nearly all of the GPIO lines have other purposes, except I haven't found any good explanation of what those uses are and how to know when they're in use. I found that quite frequently, I'd try a GPIO.setup(pin, GPIO.OUT) and get "This channel is already in use". Sometimes GPIO.cleanup() helped, and sometimes it didn't. None of this stuff has much documentation, and I haven't found any IRC channel or mailing list for discussing RPi GPIO. And of course, there's no relation between the pin number on the header and the GPIO pin number. 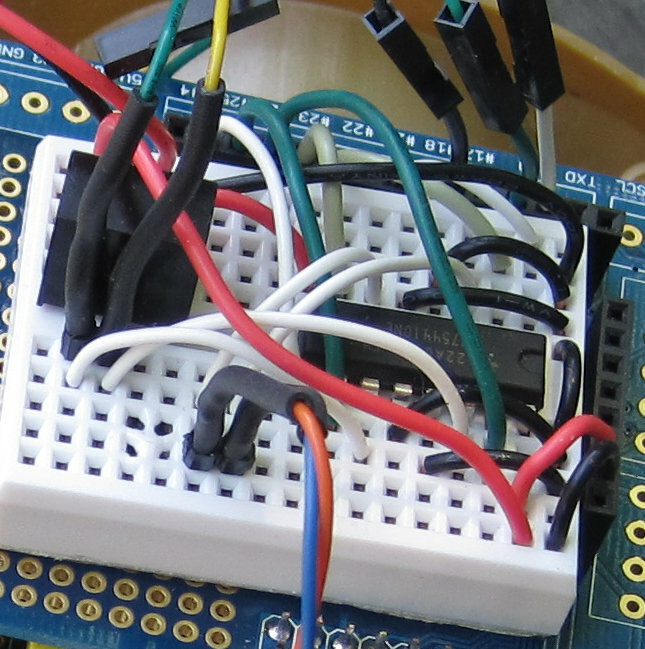 So I spent a lot of time counting breadboard rows and correlating to a printout I'd made of the RPi's GPIO socket. Once I got it working, I realized how much I didn't relish the thought of ever doing it again -- like whenever I needed to unplug the motors from the Pi and use it for something else. Fortunately, at some point I'd bought an Adafruit Pi Plate, sort of the RPi equivalent of Adafruit's Arduino ProtoShield. I love protoshields. I have a bunch of them, and I use them for all sorts of Arduino projects, so I'd bought the Pi Plate thinking it might come in handy some day. It's not quite like a protoshield, because it's expensive and heavy, loaded up with lots of pointless screw terminals. But you don't have to solder the screw terminals on; just solder the headers and you have a protoshield for your RPi on which you can put a mini breadboard and build your motor circuit. 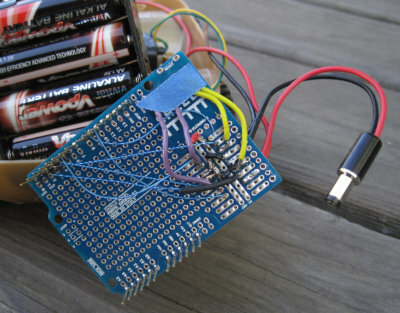 I do wish, though, that Adafruit or someone made a simple, basic proto board PCB with headers for the Pi. No screw terminals, no extra parts, just the PCB and headers, to make it easy and cheap to swap between different RPi projects. The HobbyTronics Slice of Pi looks intriguing, but the GPIO pins it exposes don't seem to be the same ones exposed on the RPI's GPIO header. I'd be interested in hearing from anyone who's tried one of these. Anyway, with the Pi Plate shield, my motor circuit looks much neater, and I can unplug it from my RPi without fear that it'll mean another half hour if I ever want to get the motors hooked up again. I did have to change some of the pin assignments yet again, because the Pi Plate doesn't expose all the GPIO pins available on the RPi header. I ended up using 25, 23, 24 for the first motor, and 17, 21, 22 for the second. I wanted to make a circuit diagram with Fritzing, but it turns out the Fritzing I have can't import part definitions like the one for Raspberry Pi, and the current Fritzing doesn't work on Debian Wheezy. So that'll have to wait. But here's a photo of my breadboarded circuit on the Pi Plate, and a link to my motor breadboarded circuit using a cable to the GPIO. I had to add one more package to Kevin's list, libqt4-sql-sqlite, or I got a lot of QSQLITE driver not loaded and other errors on the terminal, and a dialog saying "Unable to find the following 114 parts" followed by another dialog too big to fit on the screen with a list of all the missing parts. Once those packages are installed, download the Fritzing source tarball, qmake, make, and sudo make install. 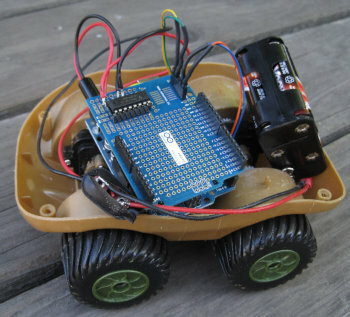 I've written about how to drive small DC motors with an Arduino, in order to drive a little toy truck around. 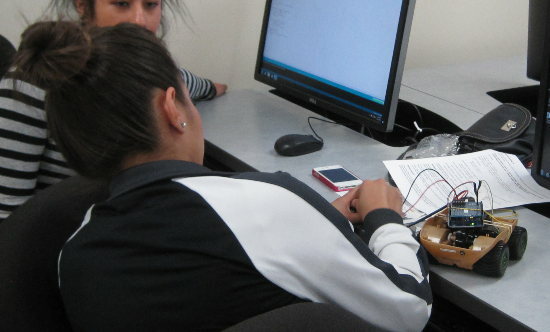 But an Arduino, while great at talking to hardware, isn't very powerful. It's easy to add simple sensors to the truck so it can stop before hitting the wall; but if I wanted to do anything complicated -- like, say, image processing with a camera -- the Arduino really isn't enough. 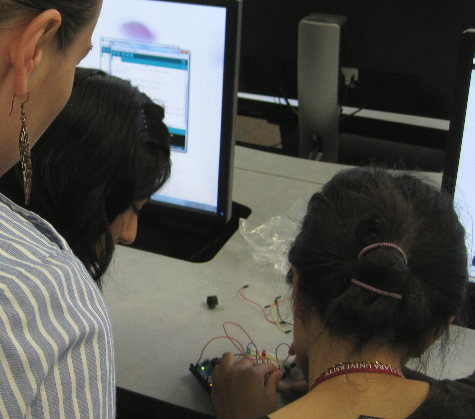 Enter Raspberry Pi. 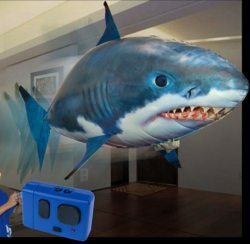 It isn't a super-fast processor either, but it's fast enough to run Linux, Python, and image processing packages like SimpleCV. A Raspberry-Pi driven truck would be a lot more powerful: in theory, I could make a little Mars Rover to drive around my backyard. If, that is, I could get the RPi driving the car's motors. Raspberry Pi, sadly, has a lot of limitations as a robotics platform. It's picky about input voltages and power; it has no analog inputs, and only one serial port (which you probably want to use for a console if you're going to debug your robot reliably). But my biggest concern was that it has only one pulse-width modulation (PWM) output, while I needed two of them to control the car's two motors. It's theoretically possible to do software PWM on any pin -- but until recently, there were no libraries supporting that. Until recently. I've been busy for the last month or two and haven't been doing much RPi experimenting. As I got back into it this week, I discovered something delightful: in the widely available python library RPi.GPIO, Software PWM is available starting with 0.5.2a. Just what I'd been wanting! So I got an LED and resistor and plugged them into a breadboard. I ran a black wire from the RPi's pin 6, ground, to the short LED pin, and connected the long pin via the resistor to the RPi's pin 18 (GPIO 24) (see the RPi Low-level peripherals for the official GPIO pin diagrams). With the LED wired up, I plugged in my serial cable, powered up the RPi with its Raspbian SD card, and connected to it with screen /dev/ttyUSB0 115200. I configured the network to work on my local net and typed sudo apt-get install python-rpi.gpio to get the latest version. It got 0.5.2a-1. Hooray! Whoops! But Raspbian said it was the right version ... I checked again with aptitude show python-rpi.gpio -- yep, 0.5.2a-1. Hmph! So PWM works great for LEDs. But would it drive my little robotic car? I unplugged my LED and wired up one of the SN754410 motor drivers circuits I'd wired up for the Arduino. And it worked just as well! 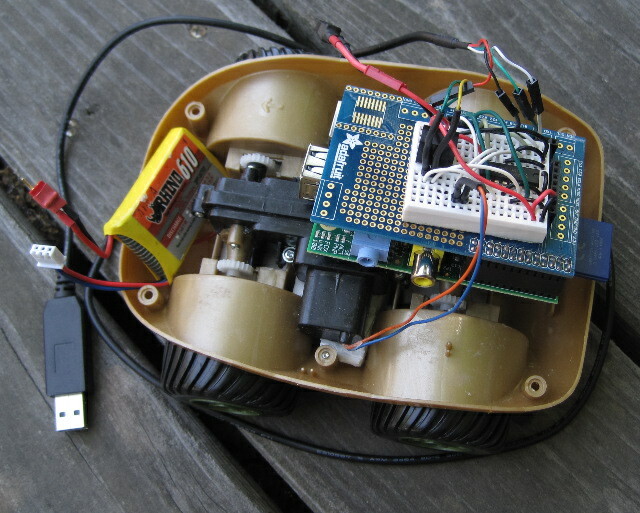 I was able to control the motor speed using ChangeDutyCycle(). I'll write that up separately, but I do have one caveat: GPIO.cleanup(), for some reason, sets the pin output to HIGH. So if you have your car plugged in and sitting on the ground when you run cleanup(), it will take off at full speed. I recommend testing with the car on a stand and the wheels off the ground. 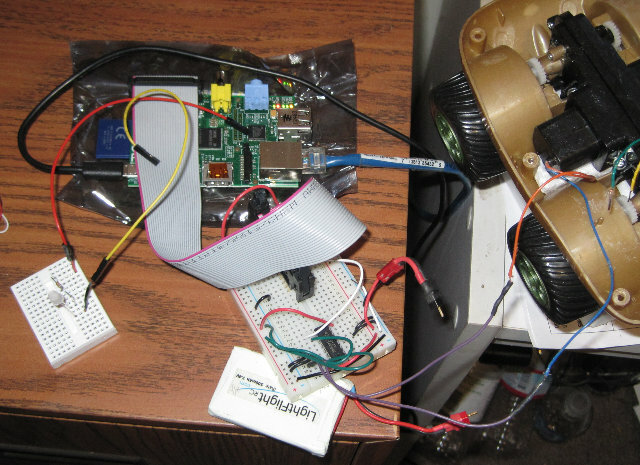 Update: the motor post is up now, at Driving two DC motors with a Raspberry Pi.